First, remove the husks and silk from the corn. Then you need to roast it. There are several ways to do this, but the easiest way is to put it under the broiler for about 15 minutes. Watch it, and turn it when it browns. You don’t want it to burn up, but you want it to look like the picture, it’s ok if a few kernels are blackish. 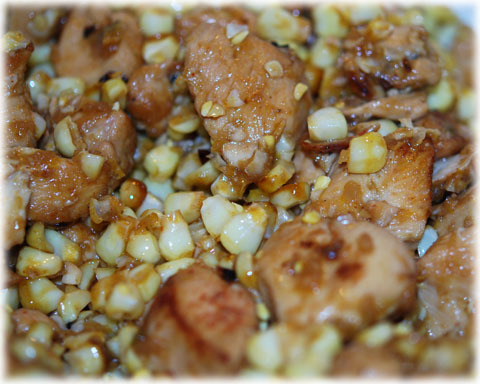 After the corn is roasted you can set it aside to cool a little while you get the chicken cooking. 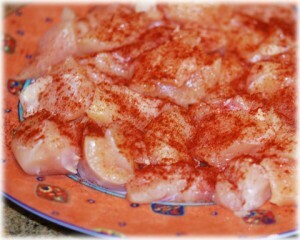 Next cut your chicken breasts into chunks (about one inch but it’s not that critical). 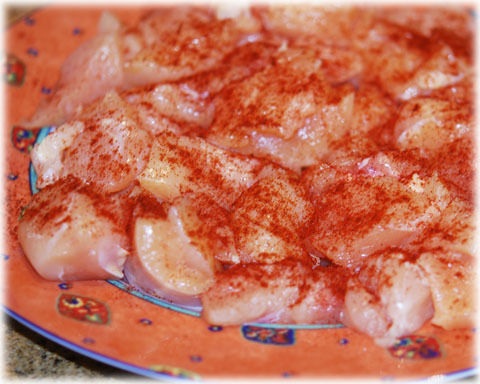 After you cut all 3 breasts into chunks, sprinkle with chipotle powder. You can vary the amount depending on how much heat you like. If you do not like things very spicy you might want to use something other than chipotle powder, perhaps smoked paprika, you might want to experiment. I LOVE things spicy, so beware! Next, melt a little butter (enough to cover the bottom) in a skillet and then sear the chicken in small batches. You want the outside crisply browned. As each batch gets done, throw it into a soup or stew pot that has a little butter in the bottom (to keep it from sticking) set on low and start the next batch. While the chicken is cooking, dice the half onion and garlic cloves. 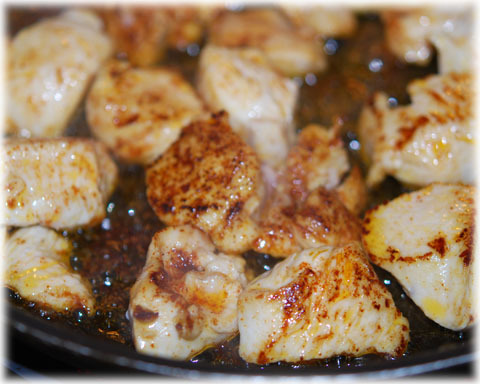 After the chicken is finished searing, toss the diced onion, garlic and green chile (which should be diced as well if it did not come diced–I have to buy mine frozen and shipped in from Hatch New Mexico). Saute in the butter from the meat until it starts to brown (but before it starts to burn, the garlic will get bitter if you cook it too long, so keep an eye on it). Then toss it into the pot with the chicken. Put a lid on the pot and let it simmer. By now the corn will be cool enough to handle. 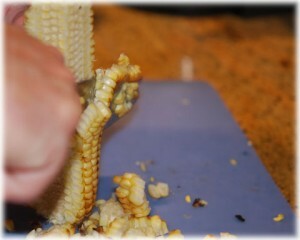 Take a large sharp knife and, being careful NOT to cut your fingers off, slice the corn off the cob. I let my husband do this, because I need my fingers for my other crafts and I’m not always really good with knives and sharp things (I’m just healing up from an incident with my cheese grater). I’m sure it’s quite easy for normal people. I don’t think corn tastes right if you don’t roast it. 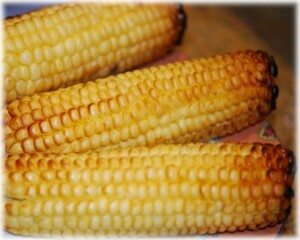 If you’ve never eaten it like this you’ve never really had corn done correctly in my opinion. I never had until my husband made it for me. If all men would do this for their wives there would be more happy marriages, I can tell you. BTW my husband said don’t forget to scrape the corn cob with the back of the knife after you’ve removed the corn to get all the juicy sweet goodness. You’ll see what he’s talking about when you do it. 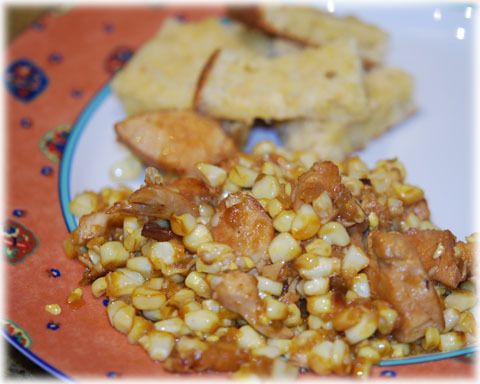 After all of the corn is removed from the cob, check the chicken, which should now be simmering in the pot. See if the chicken is done all the way through (it should be, but if not, let it simmer a little while longer). When the chicken is cooked through, add the corn and continue to cook on low, with the lid on for about 5 minutes, until the corn is heated through. 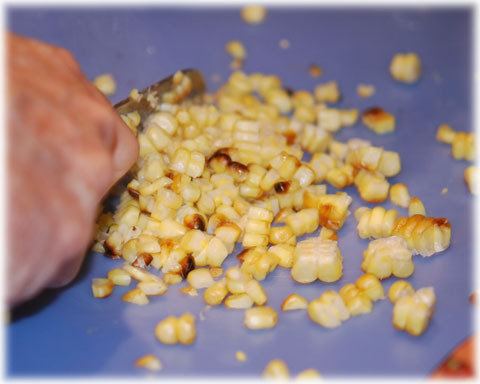 You don’t want to cook the corn too long, as you don’t want it to get mushy. I think I will send you my flour tortilla recipe, you can experiment with using something other than flour, but I guess then it wouldn’t be a flour tortilla? 😛 I always make my own because the ones you buy in the stores are paper thin and taste like paper too.